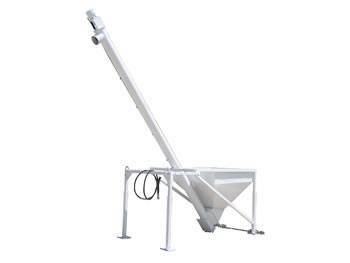 The 7SL-15B portable cement silo has a 15 Bag capacity and can load up to 2,500 lbs of cement per minute with the optional 9 inch auger and 700 lbs with the standard 6 inch auger. The 7SL-15B is designed to be used with any of the CL Series of portable batch plants. The tall discharge outlet may also be used with volumetric mixers, cement trucks, or whatever your cement delivery needs may be. The standard gasoline motor has an electric start and is durable and reliable, and will serve you well day after day. The diesel motor gets better fuel economy than the gasoline motor, and is convenient in most yards and quarries where diesel fuel is usually more readily accessible. The electric motor is the most reliable and efficient motor system. The system requires a minimum of 220 single phase power. Because power requirements vary by customer the electrical panel is built to your power requirements.